Henry Benedict Maria Clement Thomas Francis Xavier Stuart was born March 6, 1725, in the Palazzo Muti (now Palazzo Balestra) in Rome. He was the younger son of King James III and VIII and of his wife, Maria Clementina Sobieska. From his birth he bore the title of "Prince of England, Scotland, France and Ireland". Shortly after his birth (and certainly before March 28, 1733) he was raised to the Peerage of England with the title of "Duke of York". On the day of his birth Henry was baptised in the Palazzo Balestra by Pope Benedict XIII. His childhood and youth were spent between his father's residences in Rome, Albano, and Bologna. In October 1745 he arrived in Paris seeking French support for his brother Charles' campaign to restore their father to his thrones. Henry was successful in obtaining French troops, artillery and ships. However, there were ongoing delays and neither Henry nor the French force ever managed to reach Scotland to support the uprising; this was an ongoing source of friction between Henry and his brother for many years. In May and June 1746 Henry saw his only active military service at the siege of Antwerp. In October he returned to Clichy (now a suburb of Paris) where shortly afterwards he was joined by his brother. Henry remained at Clichy until the following April, when he returned to Rome. In June 1747 Pope Benedict XIV announced his intention to enroll Henry in the Sacred College of Cardinals of the Holy Roman Church. On June 30 Henry received the tonsure - the formal shaving of the scalp which precedes ordination and marks entrance into the clerical state. On July 3 he was formally created Cardinal-Deacon, receiving on July 9 the diaconal title of Santa Maria in Portico (sometimes called in Campitelli). Henceforward he used the title "Cardinal Duke of York". Henry received from the pope himself ordination to the four minor orders, the sub-diaconate, and the diaconate, on August 27, 1747, August 18, 1748, and August 25, 1748 respectively. He was ordained priest by the pope, September 1, 1748. Subsequently he received many ecclesiastical offices. In 1751 he was made Arch-Priest of the Vatican Basilica. On December 18, 1752, he was raised to the rank of Cardinal-Priest with the title of Santi XII Apostoli. On March 13, 1758, he was named Camerlengo of the Holy Roman Church; as such Henry was responsible for the administration of the Church from the death of Pope Benedict XIV until the election of Pope Clement XIII. On October 2, 1758, Pope Clement XIII named Henry, Archbishop of Corinth in partibus infidelium, and on November 19, the pope ordained him bishop in the Basilica dei Santi XII Apostoli. On February 12, 1759, Henry changed his cardinalatial title to that of Santa Maria in Trastevere. 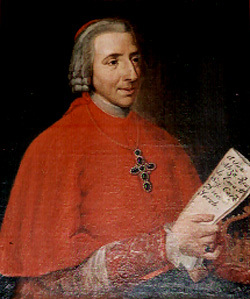 Henry was named Cardinal-Bishop with the title of Frascati, July 13, 1761. On January 24, 1763, he was named Vice-Chancellor of the Holy Roman Church, an office he held until his death. For most of the next forty years Henry lived in the town of Frascati some fifteen kilometres south of Rome. He was a very active bishop and even today is still remembered in the town for his numerous acts of charity. Henry also maintained a residence in Rome at the Palazzo della Cancelleria. In 1765 when it became clear that his father King James III and VIII was about to die, Henry sent Pope Clement XIII a memorial in an unsuccessful attempt to receive papal recognition for the rights of his brother Charles III. While at first he issued a protest against the honours Charles bestowed on his illegitimate daughter Charlotte, Duchess of Albany, Henry later came to have a very warm relationship with his niece. In January of 1784, when it appeared that his brother Charles might be on the point of dying, Henry published a protest in which he affirmed his rights of succession. At the death of his brother Charles, January 30/31, 1788, Henry succeeded to all of his British rights. He was henceforward recognised by the Jacobites as "King Henry IX". In accordance with the 1784 protest, Henry made certain changes in accordance with his new station. He now used the title "Cardinal called Duke of York" (in Latin nuncupatus and in Italian denominato) in order to indicate that this was no longer his real title. He changed his arms from those of a second son (with a crescent in the middle) to the undifferenced Royal Arms; these were now surmounted with a royal crown instead of a ducal coronet. The members of his household staff addressed him as Majesty. Henry's financial situation changed drastically in the late 1790's. For most of his life he had been very wealthy, having inherited large amounts of money and jewels from his Polish grandfather and having received a number of lucrative ecclesiastical benefices which provided him with ongoing income. But his financial resources were almost totally depleted in his support of the ransom paid to the Bonapartist French armies to stop them from sacking Rome in 1798. The general upheaval in Europe also meant that he no longer received income from his benefices in France and Spain. For many years attempts had been made to retrieve the English dowry of his grandmother Mary Beatrice of Modena, wife of King James II and VII. The de facto British government had repeatedly promised to pay this debt to the Stuarts but had never actually done so. In 1799, however, the Elector George II of Hanover agreed to pay Henry an annual pension of £4,000. While the supporters of the Elector of Hanover have represented this as an act of charity, for Henry it was no more than a first installment on the money which was legally owed to him. In accepting this money he in no way at all considered that he was renouncing his own hereditary rights or recognising the legitimacy of the Elector of Hanover's government in Britain. On September 26, 1803, Henry was named Cardinal Bishop of Ostia and Velletri; he continued however to reside in the episcopal palace at Frascati. It was there that he died, July 13, 1807, when he was succeeded in all his British rights by his second cousin twice removed Charles Emanuel of Savoy; this was confirmed by Henry's will in which he stated that his rights passed to that "prince on whom they devolve by right, by proximity of blood, and by rights of succession". Henry's remains lie in the crypt of the Basilica of Saint Peter in the Vatican, where a monument designed by Antonio Canova was raised to his memory. It is sometimes stated that in his will Henry left the crown jewels to the Elector of Hanover; this is incorrect. According to his will, Henry entrusted all his property to Monsignor Angelo Cesarini who was responsible for distributing this property (presumably according to Henry's wishes). Monsignor Cesarini sent to the Hereditary Prince of Hanover (later the Elector George IV) several jewels from Henry's private collection. These included a Lesser George (thought to have been worn by King Charles I at his execution), a St. Andrew's Cross (sometimes called St. Andrew's Jewel), and a ruby ring. The Lesser George was formerly at Windsor Castle, and the St. Andrew's Cross was formerly at Holyrood Palace. All three items are now at Edinburgh Castle. Atti, Alessandro. Il Cardinale Duca di York, Vescovo della Città e Diocesi di Frascati: Cenni Storici. Rome: Fratelli Pallotta, 1868. The first of the biographies, written by a priest of Henry's own diocese with ready access to local records. This work is the foundation upon which all other biographies are written. La Biblioteca del Cardinale: Enrico Benedetto Clemente Stuart, Duca di York a Frascati, 1761-1803. Roma: Gangelmi, 2007. Largely about Henry's library, but with other chapters on his papers and on works of art associated with him. Bindelli, Pietro. Enrico Stuart, Cardinale Duca di York. Frascati, Italy: Associazione Tuscolana "Amici di Frascati", 1982. The best modern biography - but in Italian. Includes very complete footnotes and bibliography, as well as some intereresting illustrations. Cryan, Mary Jane. Travels to Tuscany and Northern Lazio. Vetralla: Davide Ghaleb, 2004. A translation of Henry's diaries from 1763, 1764, and 1776 when he travelled to Bologna, Pisa, Florence, Viterbo, and Orvieto. Available for purchase from Elegant Etruria. Cryan, Mary Jane. Vetralla: The English Connection. Vetralla: Davide Ghaleb, 2001. A fascinating little work in English and Italian detailing Henry's 1776 visit to the city of Vetralla. Available for purchase from Elegant Etruria. Fothergill, Brian. The Cardinal King. London: Faber and Faber, 1958. The only modern English-language biography. Unfortunately it has no index, does not cite sources for specific information, and usually does not give specific dates for events. Kelly, Bernard W. Life of Henry Benedict Stuart, Cardinal Duke of York, with a Notice of Rome in His Time. London: R. & T. Washbourne, 1899. The first of the English-language biographies, it is a work of little scholarly merit marked by numerous inaccuracies. It includes, however, a number of curiosities, e.g. a list of items formerly belonging to Henry with their owners in 1899. Shield, Alice. Henry Stuart, Cardinal of York, and His Times. London: Longmans, Green, 1908. A worthy biography with frequent citation of primary sources. Vaughan, Herbert M. The Last of the Royal Stuarts: Henry Stuart, Cardinal Duke of York. London: Methuen, 1906. An uneven work, which cites some sources (often incompletely) but includes a number of inaccuracies. This page is maintained by Noel S. McFerran (noel.mcferran@rogers.com) and was last updated December 4, 2011. © Noel S. McFerran 1997-2011.